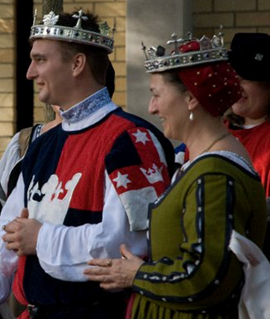 For the reign of Edmund I and Leonore I, I offered my services for assisting with the garb. I was delegated the task of coming up with a pattern, and embroidering, a blackwork collar and cuffs for a linen shirt for Edmund. His garb was in the style of 16th Century English. The Flying Monkeys of the Northern Reaches had a whole bunch of embroidery pattern resources available for me to peruse (they’re awesome like that). Most of the patterns that had been chosen for Edmund’s shirts at that point had been geometric (and possibly mostly counted blackwork). Being the “rebel” that I am, I decided to go for a more freeform pattern. From the Flying Monkeys resources, I came across a 16th Century German (from Egenolff, Modelbuch 1527; as downloaded from The Antique Pattern Library) pattern for embroidery that I felt would suit Edmund (see image below). 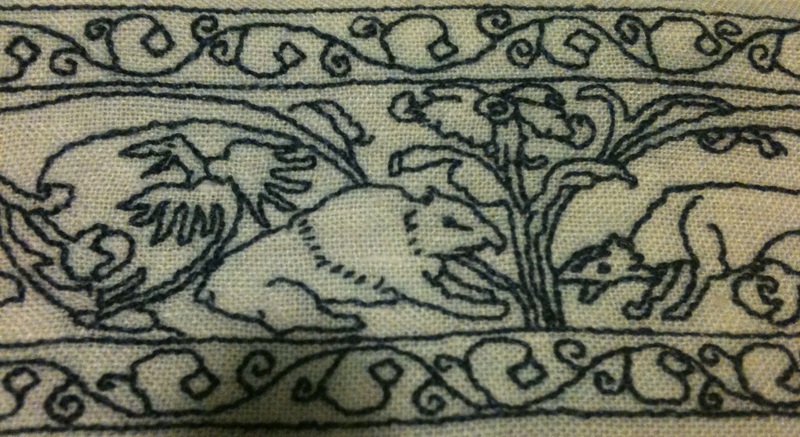 It depicted some kind of bear/badger, dogs, flowers and geometry (read: all of the things) without being counted. Perfect for what I had in mind. This was the pattern I chose for Edmund I, as from page 28 in Egenolff, Modelbuch 1527 (pdf linked in text above). 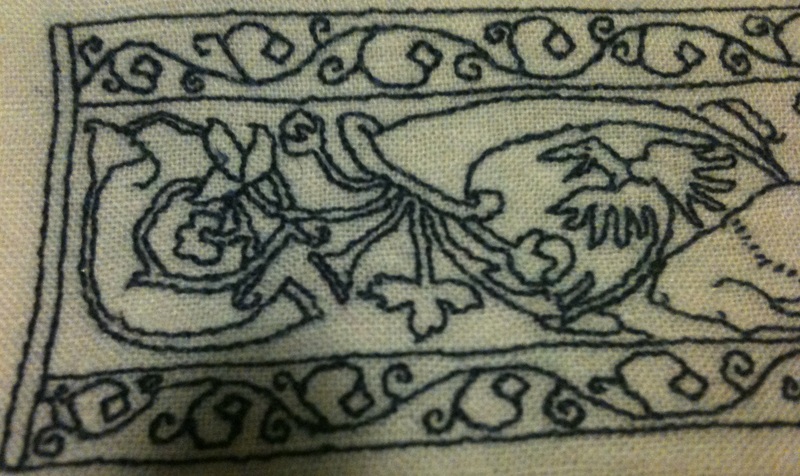 With blackwork, the general form is a linen base with silk thread embroidery in one of a number of stitches. The silk thread is often black, however, other colours can be used (it seems to be the consensus to me that, as long as it’s monochromatic, it still works… though black is the most predominant example). 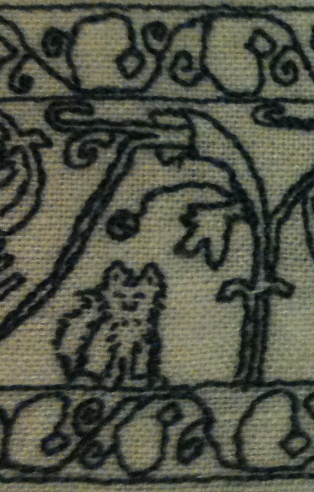 My favourite example of a non-black blackwork piece is a coif covered in squirrels and foliage, as published in the Victoria and Albert Museum (image below). In the description of this coif, the Victoria and Albert museum mentions that black was the usual colour of this style of embroidery but that they could also be done in green, blue or red. 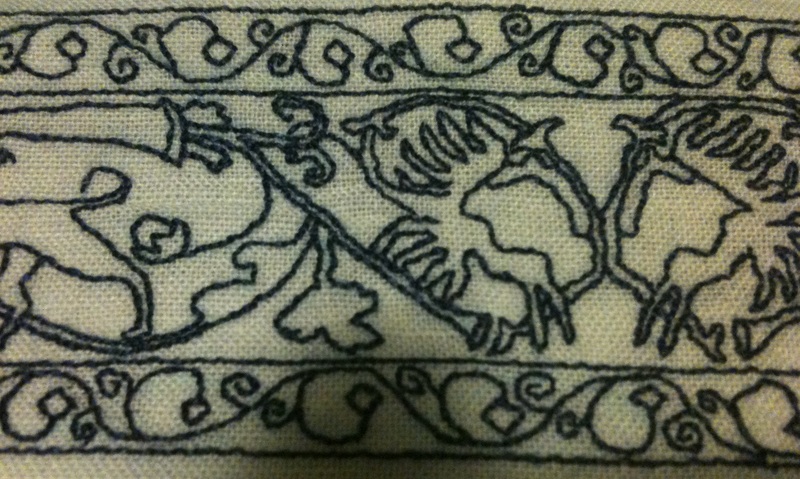 Other examples of extant 16th century blackwork can be seen online at the Victoria and Albert Museum, and in other online museum collections. Blackwork was commonly used to make embroidery samplers and to decorate collars, cuffs, sleeves, coifs, pillows and a whole range of linen items in period. Freeform blackwork was usually done in stem stitch, outline stitch or chain stitch. For Edmund’s coif I chose to use black silk thread and stem stitch, in line with period practises. The first step in embroidery is to design the pattern. I have provided links to various pattern resources at the bottom of the page. As I had chosen the pattern (pictured above) from Egenolff’s Modelbuch, the next step was to transfer the design. Unlike other kinds of embroidery, embroidery patterns onto white linen is the easiest to transfer because the linen is relatively transparent in light. I printed the pattern above to the dimensions required for Edmund’s collar (the pattern is repeated several times throughout to cover the entire collar strip). I began to trace the pattern onto the linen using a ceramic pencil (available from sewing stores, particularly quilting ones) but found it difficult because the pattern was intricate and the linen had a loose weave. After the first few motifs, I gave up on transferring (yeah… okay… I am not known for my patience) and embroidered the rest of the collar freehand. I should note that the easiest way I have found to get straight lines (for example, the borders of my piece) is to follow the weave of the linen as a guide (which is best done with even-weave linen). Drawing straight lines on fabric for blackworking doesn’t seem to work for me as the fabric moves as you draw on it and the line never seems to end up straight. In doing the pattern freehand, I made a small mistake of about 3cm in the pattern. I realised this before the last repeat of the pattern, and, to rectify this I created an ad hoc insert with foliage and a fox. The fox is sort of my signature, given that it’s my heraldic charge. I inserted an extra section to fix my error in shrinking the pattern by a few centimetres. Fox! The cuffs, as finished by Isobel and Mathilde. 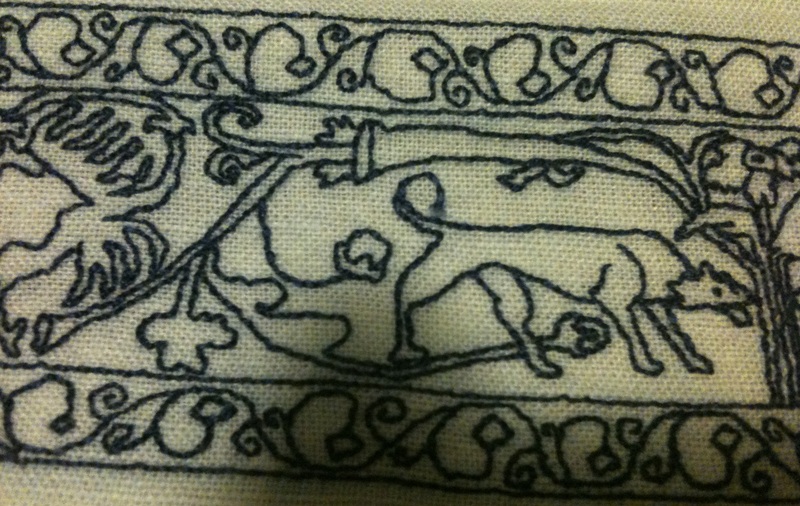 Last, but not least, here’s the collar on the completed shirt with Edmund I (the shirt was done by others). Edmund I and Leonore I. Edmund is wearing the shirt with this collar. Yay! There is an interesting article in an edition of the Kingdom of the West’s Newsletter of the Needleworkers Guild – the Filum Aureum – called The roots of blackwork embroidery (would the real blackwork please stand up! ).